The Chicago born native became interested in music at the early age of eight when his mom gave him a guitar for Christmas. At the age of 15 he began studying music and woodwinds under Louis Gray, high school band director (Crane HS). . His first performance was playing at high school graduation, and he says he was greatly influenced by Grover Washington Jr.,The Crusaders, Earth,Wind & Fire and Stevie Wonder. He moved to the Caribbean where he continued to pursue his musical career. He studied privately in St. Croix with jazz woodwinds player James (Jimmy) Hamilton, a 27 year veteran of the Duke Ellington Orchestra. Mekiel says, "I use to watch Hamilton perform from the back of the club where I worked. Then we became friends and he taught me the "Art of Reservation," and how to enhance my playing style." Mekiel explained. He also studied with Benny Jacob El (a graduate of Juilliard School of Music) and while living in St. Croix he learned calypso, reggae, Latin and other Caribbean rhythms. After several years of touring and playing with several theatrical/dance companies in the U.S. Virgin Islands, Mekiel returned to the United States and now resides in Los Angeles, CA. 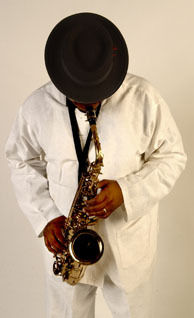 Following his dream of becoming a recording artist, when he returned to the USA he continued his music studies with the legendary saxophonist Bill Greene (improvisation lessons). He also studied music and marketing at Los Angeles City College and West Los Angeles City College. Then when Mekiel had over a hundred compositions under his belt, he started his own label with the name of MekMuse Records. He now has several releases to his credit: (1994) "Miles Away" (a dedication to Miles Davis), (1996), "Simply Peaceful," (2000) "Shadows of Love," and his latest release (2005) "Hangin in the Moonlight." Mekiel has shared stages with so many musicians on festivals and concert venues throughout North America (United States and Canada) and Europe featuring acts such as Bunny Wailer, Ziggy Marley, Maxi Priest, Third World, Steel Pulse, Inner Circle , Burning Spear, UB 40, Lenny Williams, Barbara Morrison, Ronnie Laws,The Jazz Crusader, Les Mc Canns, Marcus Miller ,Chaka Khan, Gino Vanelli, Dr. John, Tyrone Davis, Etta James, Phil Perry, George Clinton and the P-Funk All Stars, Ronnie Laws and a host of others. He worked with local backup bands for years at Los Angeles biggest reggae festival "Bob Marley Day" with artists such as Marcia Griffith, The Itals, Johnny Clark, Uroy, Eek-A-Muse and Ras Michael and the sons of Niegus and many more. While a member of Ras Michael and the sons of Niegus (5 years) they recorded an album entitled, "Know Now," on Shanachie Records. Mekiel has dedicates his talent and time for over two decade to disable students at the LAUSD, Benjamin Banneker Special Education Center when he is not on tour or performing. He has brought great joy to disabled students with music.So keep your eyes open and ears tuned for this musician / producer / composer, Mekiel B. Reuben to be the next new rising star.